Join the Phantom Thieves of Hearts! Explore the Metaverse with Futaba Sakura! 9-inch tall statue of the vigilante computer hacker from Persona 5. She includes removable glasses and the headphones she wears in the game! Need a computer hacked? Call Futaba Sakura! 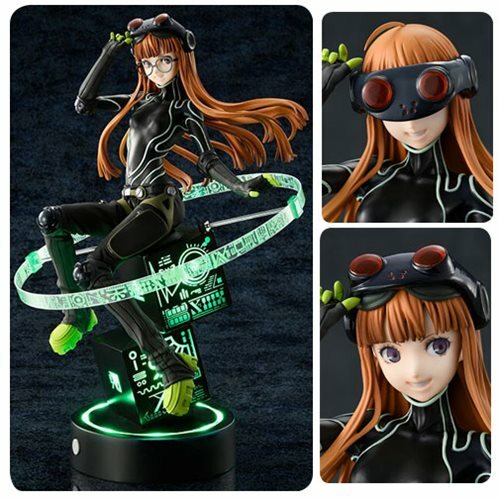 Measuring approximately 9-inches tall (including the amazing base), this Persona 5 Futaba Sakura Phantom Thief Version 1:7 Scale Statue presents the beautiful computer hacker and member of the secret vigilantes known as the Phantom Thieves of Hearts in the role-playing video game Persona 5. With her long flowing hair and a smiling face, she includes removable glasses and the headphones she wears in the game. Order Futaba Sakura today and prepare to meet the Shadows!